There is something about big bugs that drive otherwise normally sane people over the edge, and they become blubbering, bleary eyed zombie-like individuals wandering around muttering about 'finding the hatch,' 'the big one that got away,' and similar statements. The uninitiated non-fisher folks view them with suspicion, employers anticipate that they will be calling in sick, and family members put on hold any plans until the big bug fever passes. In early summer there are two big bugs that tend to drive fly anglers a bit 'buggy.' In the Midwest the famous Hex hatch, The Michigan Night Hatching Caddis, which is really not a caddis but a very large mayfly [Hexagenia limbata], and in the Rocky Mountain West it is the Salmon Fly, not really associated with salmon of any kind, but really just a supersized stonefly [Pteronarcys californica]. Both of these super bugs are as unpredictable as a Montana spring, and as irregular and fickle as young love, but like a Montana spring day and young love when you experience them once you will keep coming back for more. Unlike lesser bugs, big bugs require a specific set of circumstances to produce that truly memorable hatch which anglers spend the rest of their lives reliving. Chief among the variables is the weather. Hexagenia mayflies don't like cool, wet weather, and they are not particularly partial to bright moonlight. A cool wet stretch of weather during the emergence of the Hex usually results in a very sparse hatch that may sputter along for several weeks without producing enough insects at one time to get the big fish to take notice. Western rivers that harbor fishable hatches of the big Salmon Fly are very unpredictable during late June and early July. Many of the better streams are still running bank full with spring runoff, they are cold and often off colored, if not chocolate brown. Salmon flies are tough bugs, and high, cold, and discolored water does not discourage them from hatching, but it does present sizeable challenges for both the trout and the trout angler. I have many unforgettable memories of chasing hatches of big bugs, and many of them center on the unpredictable nature of these hatches. There was a beautiful midsummer night in Michigan on the South Branch of the Au Sable River. Several of my fishing pals from that era were spread out along a particularly promising stretch of river deep in the Mason Tract waiting the Hex spinner fall. As the darkness gathered we could hear a high pitch hum that grew progressively louder as the darkness deepened. Cautiously I shone the beam of my flashlight upward and was amazed by the mass of big Hex spinners just above my head. With baited breath [no pun intended] we all waited to hear the sound of the big browns that inhabited this stretch of water begin to feed. The hum, made by the wings of the thousands of spinners, gradually began to dissipate to be replaced by an eerie silence. There were no slurping sounds or explosive splashes indicating a feeding frenzy was taking place in the darkness. Cautiously I shone my flashlight upward where only moments before a dancing mass of spinners blocked the beam. Nothing! A glance at the water's surface produced the same results. Like a curtain being drawn across a window a wave of cold air descended on the river, and the first wisps of vapor began to rise from the warmer water of the stream. The cold air had pushed the spinners back into the trees. There would be no large fish caught here tonight. In later years I moved my home location from Michigan to Montana, from Hexagenia mayflies to Pteronarcys stoneflies. I quickly learned that hitting the salmon fly hatch was even a greater challenge than finding the Hex hatch. The large stonefly nymphs crawl to the bank to hatch and many of them fall victim to the waiting trout. If the emergence is heavy by the time the adult bugs return to the water to lay their eggs many of the trout are completely satiated from eating the large nymphs. There are few things in fly fishing than seeing the surface of the water littered with large struggling flies and not see a single fish rising to eat them. Salmon flies hatch as many of the streams are just beginning to recover from spring runoff. This is also the beginning of the summer thundershower season, and a heavy shower somewhere in the headwaters of your favorite stream can turn it into a muddy unfishable quagmire in the matter of a few hours. There may be many bugs on the water but not a single trout rising to this bountiful feast. 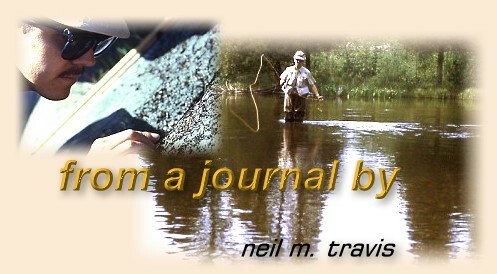 Since the only practical way of fishing the Salmon Fly hatch is from a boat the high rapidly running water presents a series of casting and presentation problems. The fish will normally be holding close to the bank, under streamside brush and trees and you are hurdling along like a jet plane with its afterburners on. Casts must be made quickly, often to very small pockets next to the bank or beneath low slung tree branches. The drift is short, the take often explosive with the trout quickly darting out into the deeper water. If you have ever experienced this type of fishing you know the routine. Given all these uncertainties why do grown men and women forsake their jobs, home and families to chase trout under these conditions? For me it's the memory of that night on the Au Sable River when the Hex began to hatch just at dark, and suddenly the stream was alive with rising trout of memorable proportions. Nearly every cast produced a solid take, and just when I thought the hatch was beginning to peter out for the night the spinners began to fall. It was well after midnight when one very tired angler finally stumbled back through Jack Pine forest to his car. Like a Montana spring or first love, once you have experienced it you will keep coming back for more.